One of the leading causes of conversion issues for independent online stores is a poorly designed website and difficulty navigating it. Approximately 20% of potential customers are known to have opted out of shopping with ecommerce retailers citing the aforementioned reasons. By having a poorly designed website that’s difficult to navigate, small ecommerce business owners can lose customers and profits, but luckily with the right website theme these issues can be avoided. 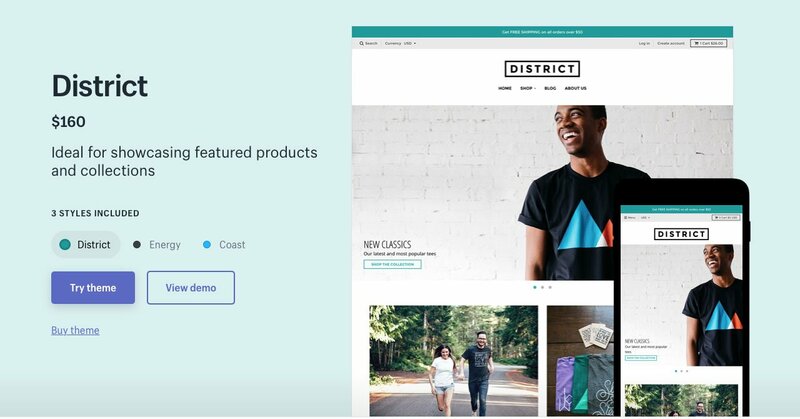 Since most ecommerce retailers sell via Shopify’s ecommerce platform, this article will focus on helping ecommerce merchants pick the best Shopify themes for their online store. As a Shopify merchant, your website itself is one of the first places that a potential customer will interact with your brand. It is no longer sufficient to just have a simple site with a checkout system in place, it now has to be a fresh and exciting experience for the customer that they’ll truly enjoy. Furthermore, the better your website looks, the more credible it seems. No one wants to shop on an illegitimate-looking website, not even you. So why would your customers? It’s important to remember that your ecommerce website is your primary form of owned media. No matter how many affiliated social media pages, strategically placed ads and brilliantly presented YouTube channels you may have, they all ultimately lead back to your website. This is why your Shopify theme is so incredibly important: It’s the ultimate landing spot for your traffic! In today’s online world a website is judged by its cover, so you have to make sure your store’s Shopify theme reflects your brand’s personality and the values of your business while still being functional and easy to navigate. With an ecommerce platform such as Shopify, however, creating a beautiful and functional online store is as easy as browsing through all the available Shopify themes. 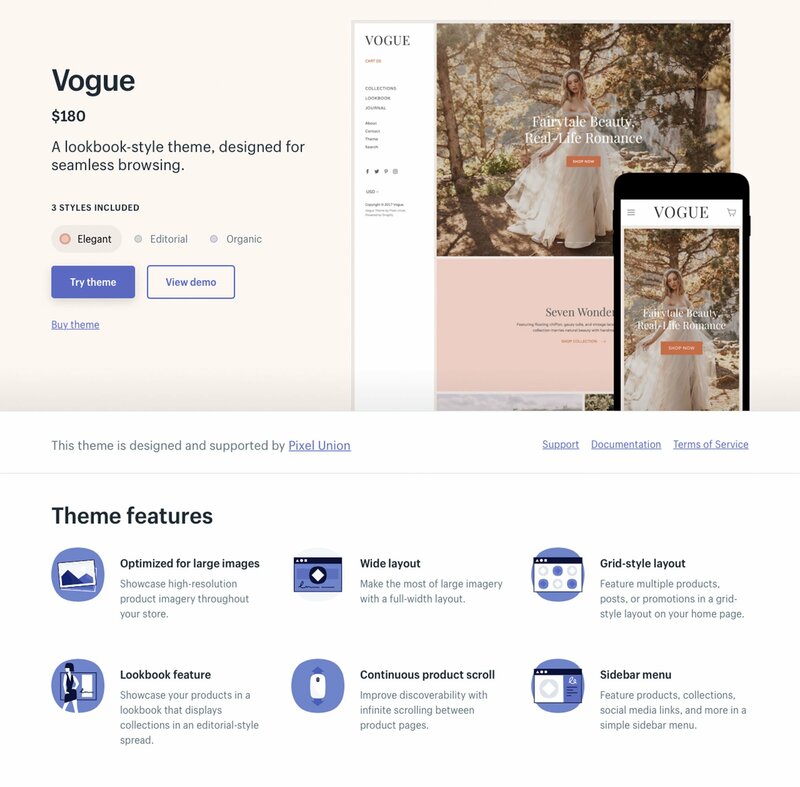 The platform provides over 100 free and premium Shopify themes to pick from featuring designs that are clean, responsive and have been created by leading website designers. 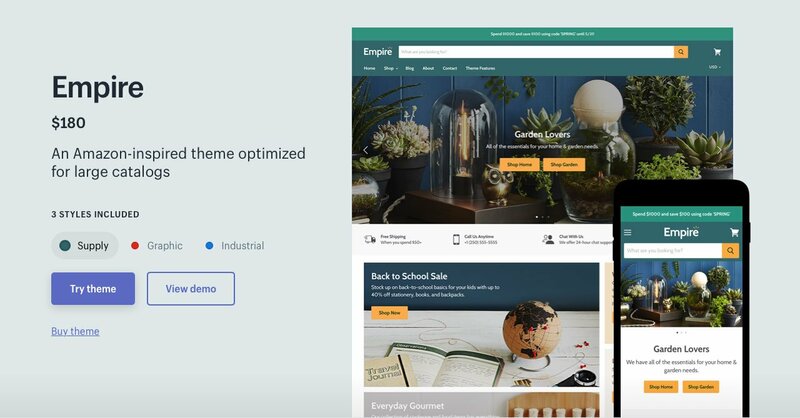 Let’s dive into everything you need to know about picking the perfect Shopify theme for your online store. What is a Website Theme & Why is it Important? Shopify is undoubtedly the leader in the ecommerce platform space. As an online ecommerce platform, Shopify allows store owners to sell all kinds of products and services online. 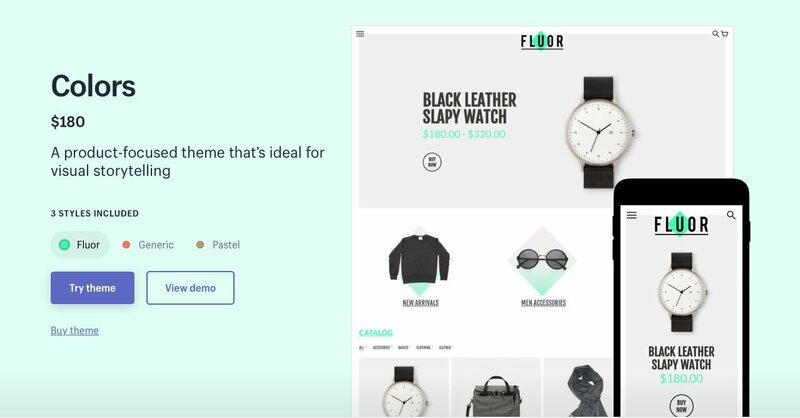 Since the platform presents itself as a fully integrated ecommerce solution, it features an “out of the box and ready to use” interface, with several interesting and useful features for ecommerce merchants to build their own online store with, which we discussed thoroughly in our Shopify Review. 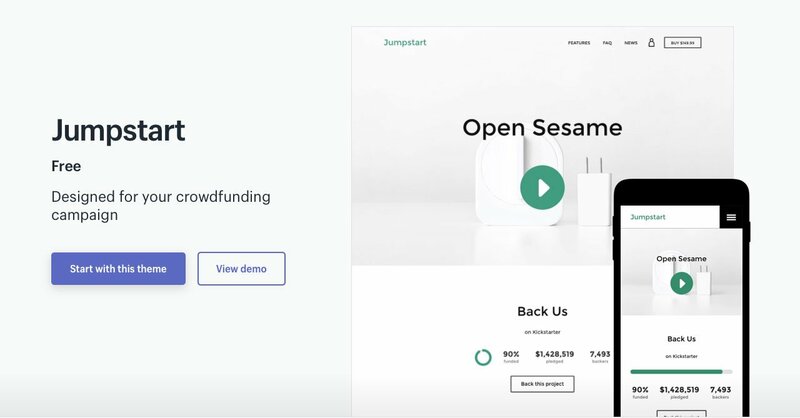 But ultimately, the platform has customizable Shopify themes which merchants can use to truly make their online store their own and make their websites beautiful and functional by displaying products as they wish, tracking and fulfilling orders, accepting online payments and much more. Shopify’s pricing plans are based on a monthly billing system and there are various payment plans to suit individual needs starting from $9 and progressing to $29, $79 and ultimately $179. However, Shopify also provides a 14 day free trial so that any new merchants can test out all the features of the platform before making a commitment. Shopify has been created to be as hassle-free as possible for merchants, so it’s relatively easy to set up an ecommerce store and get it running in no time. 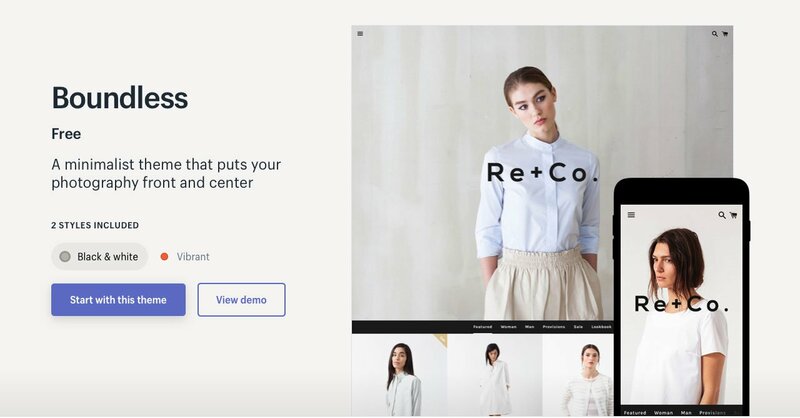 The service itself is quite intuitive: After signing up you can pick from over a hundred online store designs to find the right Shopify theme for you and then you can customize your chosen theme to your liking, which eliminates the need for you to hire a designer or have any prior design knowledge on your part. The website designs that are offered are visually impressive and claim to be as optimized as possible to boost your customer conversion rates. As Shopify is a cloud-based platform, it also conveniently offers web hosting on a server structure that is specifically built and optimized for ecommerce. As a business owner this just means one fewer cost, as you don’t need to host your website elsewhere. Another great feature, which is extremely useful if you are already a business owner with an actual brick-and-mortar store, is that Shopify also offers offline solutions which can be easily integrated with your current operations. The infrastructure that the platform provides is great for scaling your business as Shopify can handle everything from an increase in the products you sell to an increase in the number of sales you make, seamlessly. This means that you can directly sell on platforms such as Facebook, Pinterest, Twitter and other social networking sites, or you can even have a brick-and-mortar store with a point of sale (POS) system and its own payment processing service, too. Shopify is truly a user friendly platform which makes it perfect for both beginners in the ecommerce space as well as seasoned professionals. The multipurpose aspects of this platform make it an ideal solution for any ecommerce merchants looking for a great ecommerce platform with useful features they can use to create a beautiful and functional ecommerce website with. The platform’s ease of use, affordable pricing structure and its variety of features is what makes Shopify one of the most attractive ecommerce platforms out there. Unlike the usual way of building an online store from scratch, a website theme (also occasionally referred to as a “website template”) is a set website design that can be used to create a new online store or it can be applied to an existing one. As a merchant on Shopify, all you need to do is download one of the Shopify themes and install it onto your website and then you can customize the colors, fonts, layouts and options of the theme to make it your own. “A website template is basically a premade web page — or set of webpages — that can be customized with images, videos and other style elements to create a complete website. Often created by web developers, the template includes everything needed (i.e. HTML, CSS, and any other code required) for it to function. It simplifies the whole web development process, making it easy for people who have little or no programming experience to build their own websites. Anyone who knows even the basics of web designing will tell you that at the core of the website making process, the goal is to create a clean, good looking website that has accessibility at its crux and a simple and fluid interface, especially when it comes to navigation. The look of your website is the first impression of your brand in the customer’s mind and essentially determines whether they will be attracted to what you have to offer them. Picking a Shopify theme for your online store is as important as the products you sell, as it represents what you and your brand stand for and will also have an impact on factors such as brand recall and customer experience. While getting custom website themes designed can set merchants back monetarily quite a bit, top brands and companies still sometimes opt for custom themes which can often cost them thousands and thousands of dollars. If, however, you are a small business owner or are fairly new to the ecommerce industry, your best option is to look into pre-designed themes that are provided by platforms such as Shopify on the Shopify theme store. Don’t be fooled by Shopify themes being free or reasonably priced since they provide an equally professional look as custom themes do, and are much more simple when it comes to application and installation which is an advantage for new merchants with no programming experience. 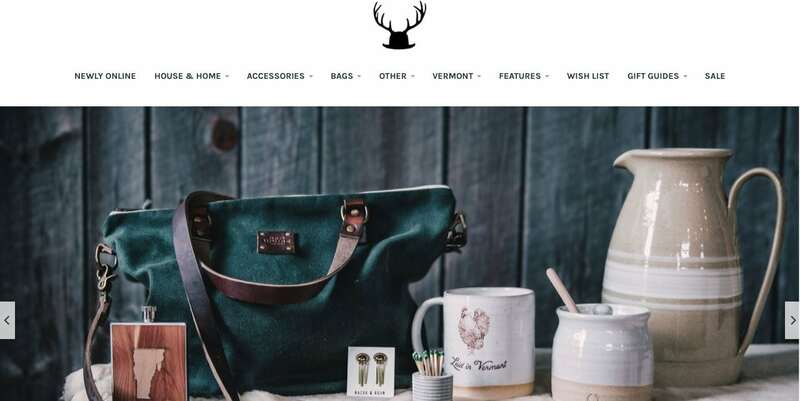 Like every step of building your ecommerce store, trying to make the right choice can be overwhelming due to its importance, but finding the right Shopify theme is a crucial aspect to your brand’s success. This is also why you should pay attention to the smaller details while picking a theme, such as the budget you have set and if your chosen theme falls within it, the kind of experience you have with web design so that you can pick a theme with more scope for personalization, and of course, the inbuilt customization options. While putting so much importance on the theme might seem like overkill, it will eventually form the basis of the public perception of your brand. 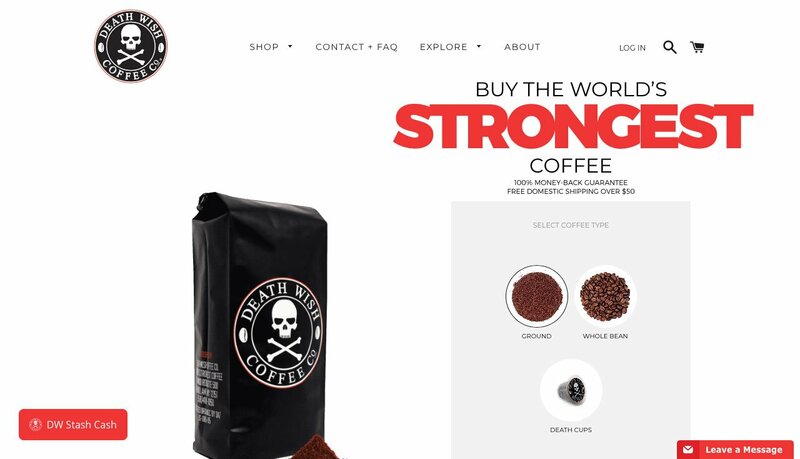 The website for Death Wish Coffee Co. embodies the company’s spirit. The website claims that their brand of coffee is the strongest in the world due to its unique blend and roasting technique, while also being smooth to taste. The web design is robust and uses colours like red, large bold letters and imagery that is consistent with the brand name and logo. Due to the product being one of the focal points of the entire business, the homepage opens to a large image of it with an option to buy/subscribe to it. There is no lag in getting to the product page, which makes this a very “in-your-face” approach, but it suits the brand very much and definitely works for them. Additionally, the black, white & red is a classic colour scheme and complements the product packaging theme as well. This website has a casual yet sleek feel to it, which is what the brand aims to promote its products as. It uses a brilliant mix of gifs, images and illustrations along with videos to showcase the brand’s youthfulness. The playful vibe definitely makes the user want to explore the website more. Another great feature is the way the website features testimonials from Instagram users who have bought and reviewed the products. 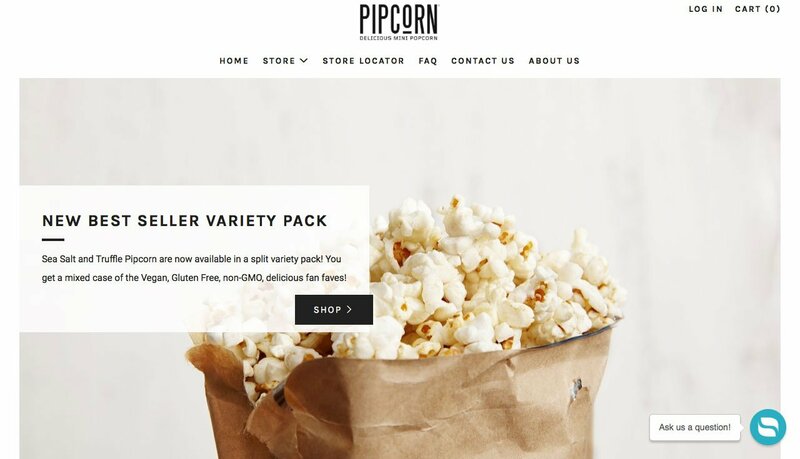 Following the standard ecommerce website pattern, Pipsnacks incorporates its own charming fonts, colours and designs while highlighting their products with large imagery and text. The product packaging compliments the website’s theme and is really soothing to the eyes. Almost everything – from the logo to the product photography – has a very western and rustic feel to it which aligns with the company since they produce and sell “American Made Goods.” The website follows the standard format of ecommerce websites, getting right to showcasing the products, but the product images introduce a little of the brand character to the user, which is basically the entire point. Pastel watercolour brush strokes make up the header and the footer of Leif’s ecommerce website. Muted colours highlight the dainty font and gives the website a delicate feel. In contrast, the product photos are more bold, truly stand out and draw the user’s eye to them. The handwritten logo style and banners give a personalised feel to the web design. This website is beautifully simple yet eye-catching. The company’s website aims at a sale right off the bat. The visuals of the product are large and stand out against the subdued background. There is also a direct link to the Amazon shopping page for the product, which is highlighted in a brighter orange colour to stand out against the rest of the homepage. Beardbrand, just with its name and logo already defines its niche. 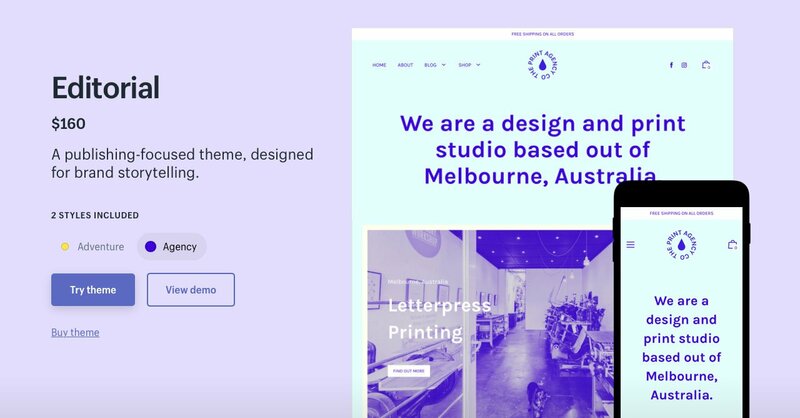 The company’s Shopify theme is clean yet robust. The homepage itself basically encompasses several different aspects – from products to merchandise to social media and even tutorials and testimonials. Heavy on imagery that is aesthetically appealing, with just enough text to contextualize what one is looking at, this website aims and definitely succeeds at keeping the user engaged. The home page opens with a quirky message that’s likely to grab the attention of visitors and appeal to their target market. The quirky copy reflects the fun nature of the brand and the types of products you’ll find there – fun and quirky ones. Their calls-to-action are prominently place on the page, with one at the centre of the page for the promoted product, plus collection pages for both men and women clearly placed directly below. 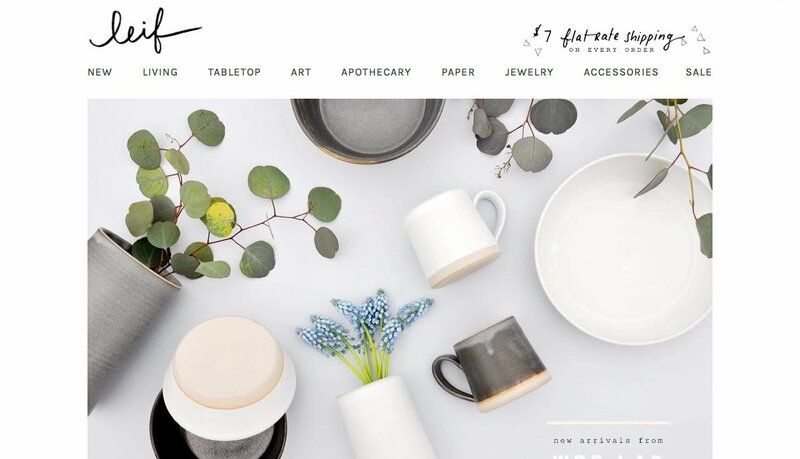 Note: For more great examples of Shopify themes, check out our 50 Beautiful & Creative Ecommerce Website Designs article, as well as Shopify’s 100+ Beautiful & Creative Ecommerce Website Designs article. 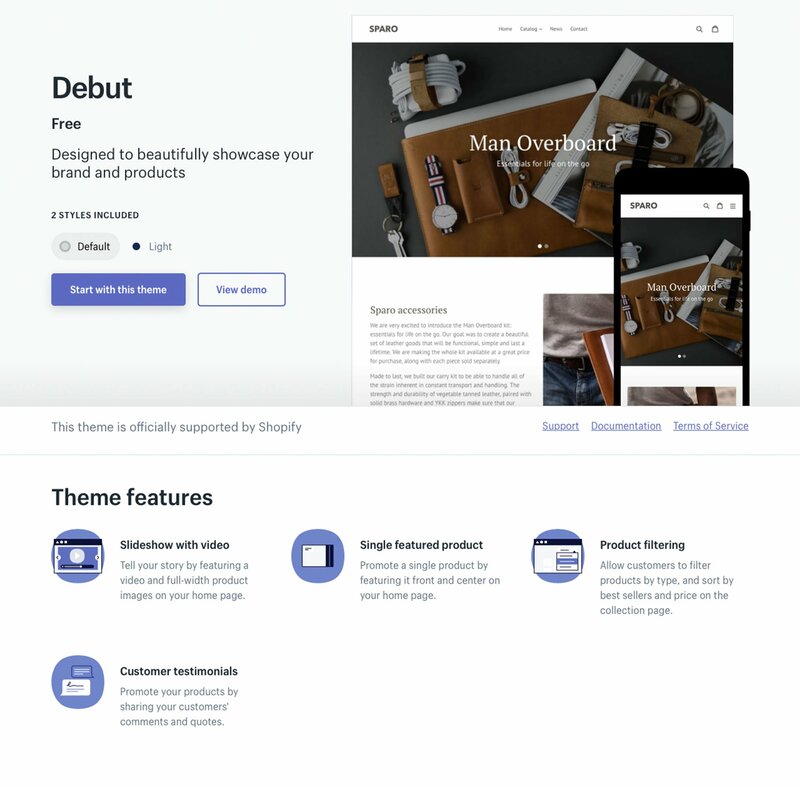 One of the best aspects of using Shopify themes is the fact that you can preview how your website and products will look with your new theme before you download the theme to your site. When creating Shopify themes, the designers use high-definition, aesthetically appealing and colour coordinated images to make their designs stand out in the Shopify theme store, so while you initially might think your own products and branding will fit into the mould, they might not seem exactly right and as if they were “matched” to the theme once you actually set up the theme onto your store. 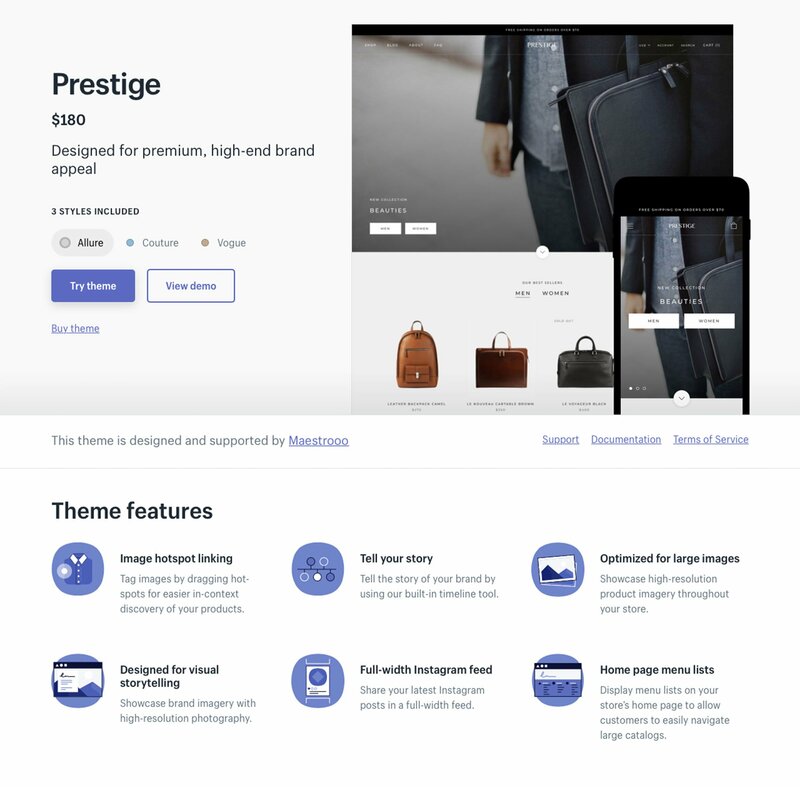 Being able to preview the theme, however, helps you mitigate any mismatched themes with your branding so you can be sure that you download the right Shopify theme for your store. 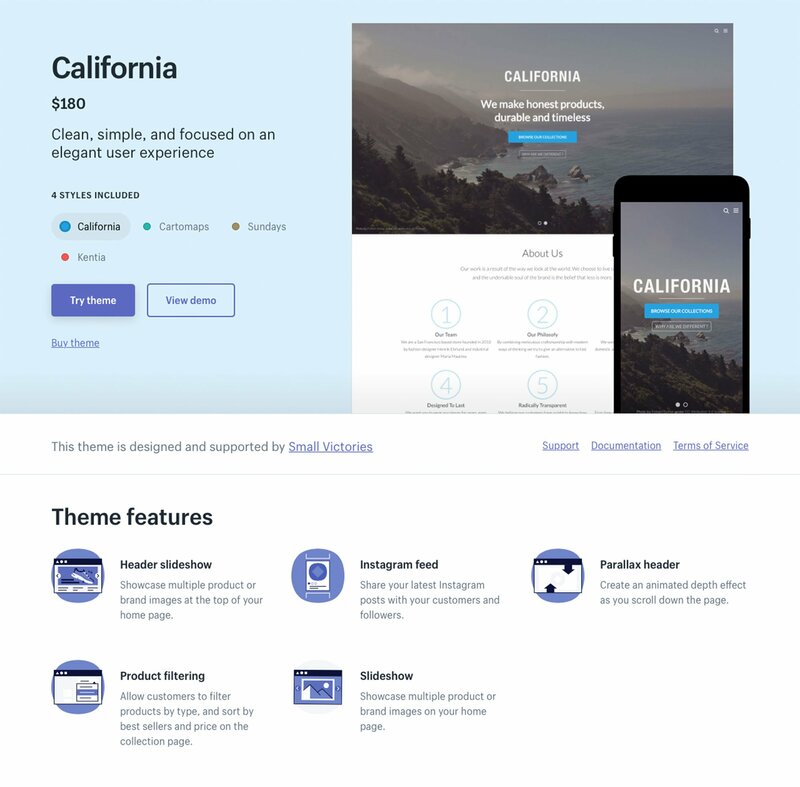 If you don’t want visitors to lose interest in your website and/or brand, then it would be wise to choose a Shopify theme that is void of any unnecessary multimedia elements such as animations or live banners as well as any atypical navigational elements. While these kind of elements might make your website seem more attractive, they will only add bulk to your website and slow down the speed at which the website will load. The “lighter” your Shopify theme is, the more focus there will be on improving the customer’s experience on your website which, in turn, will improve conversion rates. If you are reluctant to pick a “fast” loading Shopify theme, here is a fact that will likely change your mind: If Amazon’s website loaded one second slower than it normally does, it would cost them 16 billion dollars in sales, annually. Visitors don’t like to wait for sites to load and on average, they’ll wait 3 seconds and then click away if the site doesn’t load. While the stakes may not be as high for you and your brand, this information should tell you how the loading speed of the theme on your website can impact your sales, so be sure to keep that in mind while picking a template for your store. Since the advent of the smartphone, the number of sales on ecommerce websites has increasingly come from mobile devices (phones, tablets, etc) and these days, almost half of the sales on Shopify are through mobile devices! This information should most certainly factor into the type of theme you choose for your Shopify store. It must have a mobile version, or at least, should be compatible. Due to how critical it is that you have a mobile friendly website, avoid making the mistake of checking the mobile friendly version after you’ve installed the theme already. This step should be done before to save time, resources and avoid losing out on potential customers. It’s also important to check both the mobile version, as well as the desktop version of the website to make sure there are no glitches if and when used on different devices. Another great reason to work with free Shopify themes is because they are already optimized to be used on both desktop and mobile platforms. This means that you don’t have to worry whether your website will look great on mobile devices because it’s already been optimized to! This means less work for you and a better experience for your customers. How much design experience do you have? Do you have someone on your team who has expertise in web or graphic design? Or perhaps a friend who is willing to help you out? While these may not seem like your primary concerns when choosing a theme for your website, it could affect your business in the long run. If you are lacking in budget and/or experience, choose a Shopify Theme that’s simple, easy to edit and comes with support and documentation you can use for any troubleshooting down the line. 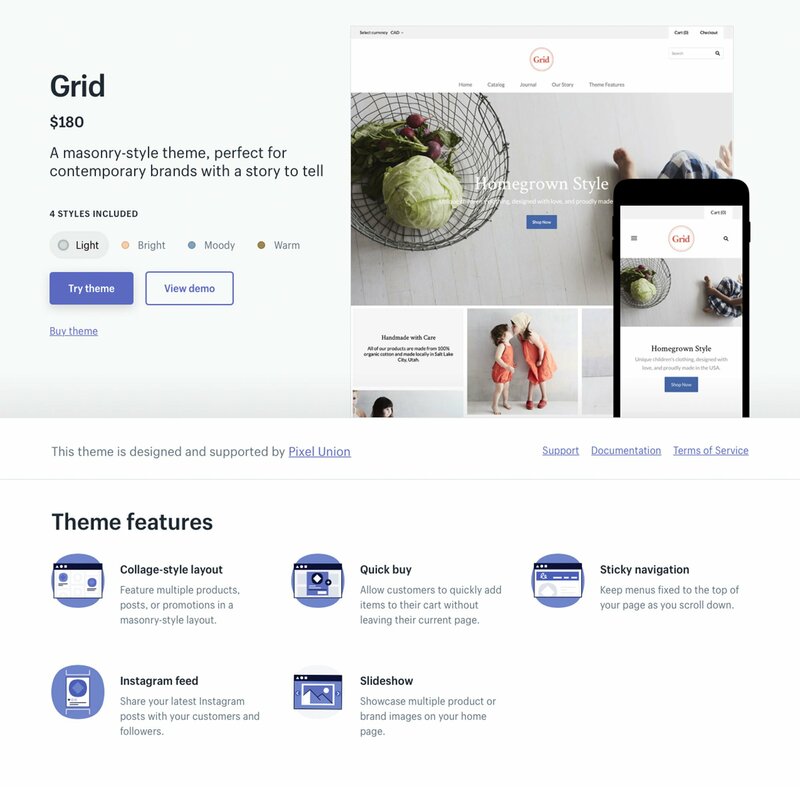 Some Shopify themes will be better suited for merchants who already have experience customizing themes, so if that’s not a skill set you possess then consider steering clear of any especially complicated themes. 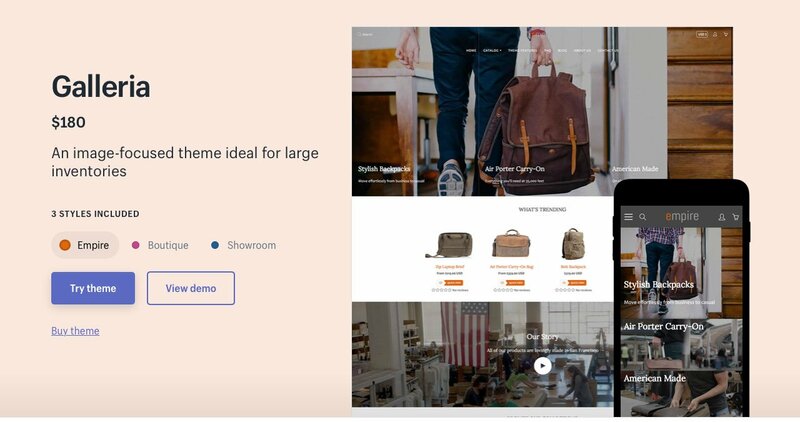 Luckily enough, however, Shopify themes are generally designed to be used by merchants of all experience levels, so there should hardly ever be a Shopify theme that a new Shopify merchant can’t use for their store. If there ever comes a time that your Shopify theme is too complicated for you to customize, or you’d just rather have a professional do it, then services such as Carson Shopify Experts, Storetasker or TaskHusky can complete the task for you. Remember, a good theme will take up minimal resources and still give you high conversion rates whether it’s a free Shopify theme or a premium one, so even if you don’t have the resources or experience, you don’t need to worry. Just pick the right theme for your experience level! 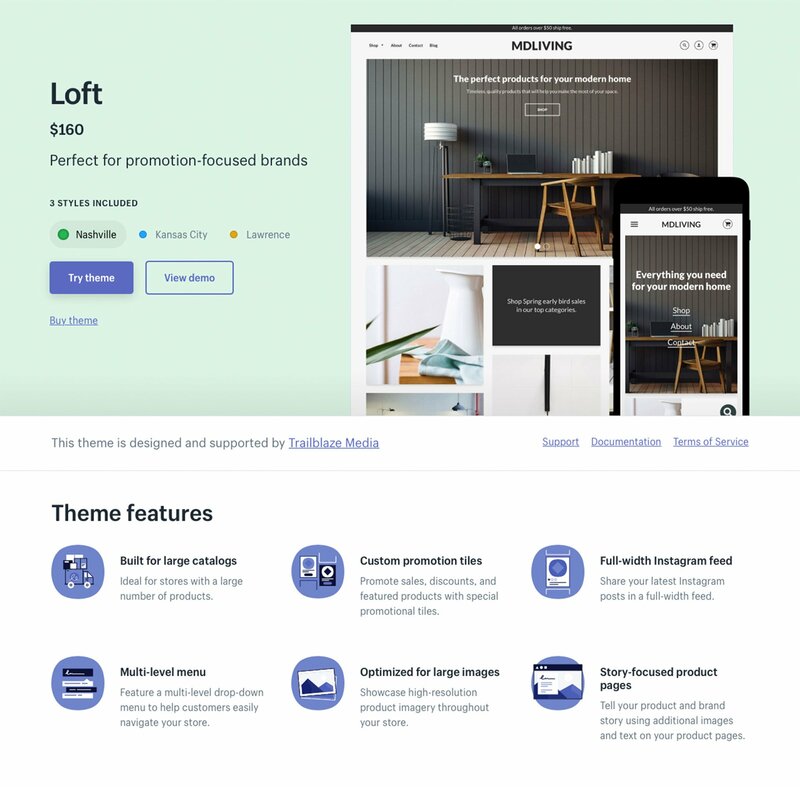 While looking for a Shopify theme, be sure to also check for the relevant support and documentation that comes with every theme on the Shopify Theme Store. If you are downloading a theme from another marketplace (like the ones we discuss in the section down below) be sure that they also provide you with similar support and documentation. As a business owner, you constantly have multiple responsibilities and tasks to juggle at any given time, however, technical issues and problems with your Shopify theme should not be something you deal with often. Having a community of developers supporting you if things go wrong (as they sometimes do) who are able to fix any issues as they arise is very important. This community of technical support is also important to discuss theme issues with so you can learn from experts and resolve any potential issues you face in the future. Make sure to note how detailed the documentation for your Shopify theme is and the ways that you can get in touch with the theme developer, if need be. Just as you might collect product reviews on your website, many Shopify themes also include reviews from others merchants. These reviews can be useful to check out to see if there are any bugs or issues that other merchants encounter after installing the theme. Another thing to look out for is the customer support team and how they handle queries and complaints. If they are prompt and offer solutions to others, it might be a good choice of theme to go with! Absolutely! The free Shopify themes that are available incorporate all the necessary elements for creating a gorgeous and intuitive online storefront. The majority of the free Shopify themes still provide great customization options so you can also match them to your own branding. 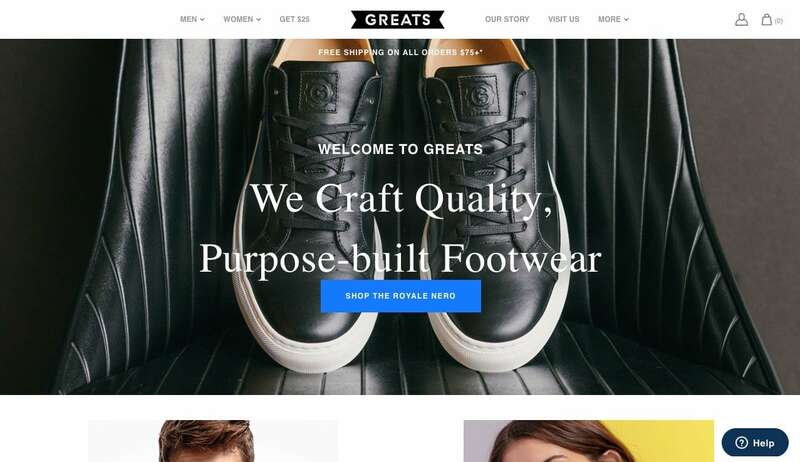 The best part is that all of the free Shopify themes are still easy to install on your Shopify store without any knowledge or experience in web design. 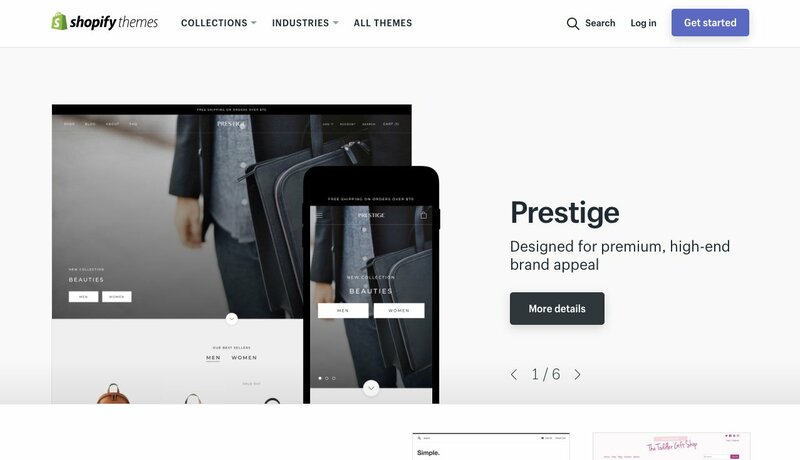 While it’s understandable that you would want the best of the best for your business, thus the free Shopify themes may not be your first choice when it comes to picking a theme for your own website, take into consideration that it might not be the smartest idea to spend your budget on fancy themes right away. This stands true, even more so, if you have just started your first ecommerce business and may not have a good understanding of what you want and need from a working Shopify theme. You can always start with a free theme and then switch up the theme to a more premium one later once you know what you need in a theme and once your business picks. Themes in Shopify come with a settings menu to help you change various components like color, font, images easily – of course if you want to dig into the code then the theme editor is available also. Themes might offer different features and capabilities, like ‘quick add-to-cart’ from a collection grid, or easy implementation for product personalization (think monograms) – which can all be differentiated by the way the developer set up the cart/data. Dig into theme descriptions to see what features they’re talking about. Here’s the approach I’ve taken, I’ve got the time and interest to learn how to make these functions for my site – and we probably won’t ever find the ‘perfect’ solution with all the various capabilities we want – so pick a basic theme, get cosy and start searching and reading. The Shopify platform is remarkably flexible and you can see great stuff being done on it all the time… that’s because they make a lot of the code available for developers to adjust. The preview function in Theme Manager is great for testing code and changes and then seeing them on Refresh without affecting current customer shopping. But if you’d rather focus on selling, SEO and running your business (instead of web development) then there are some great themes that might provide the initial UI, site functionality you need. One of the most overlooked features when picking a Shopify theme is blog functionality and content marketing. It’s important because all of the content you create will be showcased in this section of your website, it’s the part of your website that will help your brand become more discoverable and it’s also where customers will go when they’re looking to engage with your brand beyond a transaction. It’s blog content that helps build an emotional connection between your customers and your brand, so don’t overlook this feature. A well designed blog is essential when you choose a Shopify theme. Make sure to preview the blog page of the Shopify themes you review instead of tacking it on after installation. The way the blog section is put together will also determine how some of your written content will come across, so pay attention to the details. You should ideally be able to include tags with your posts, which not only make it easy to locate content pieces but they are also important for the SEO side of things. Having the ability to post pictures along with the written text on your blog is also crucial. Make sure that the blog’s aesthetic matches well with your brand’s imagery to ensure a good fit. It’s crucial to understand that your website’s product pages are technically your money maker. They are where purchases will be made on your site, they’ll be one of the top visited pages by your customers and they will also have an impact on your conversion rates. The focus of your product pages should be solely on making sales which is why they need to be one of the best looking and best optimized landing pages on your site. The decision of which Shopify theme you pick for your ecommerce store should be based on these factors. One feature of a great product page is the incorporation of high quality multimedia elements. 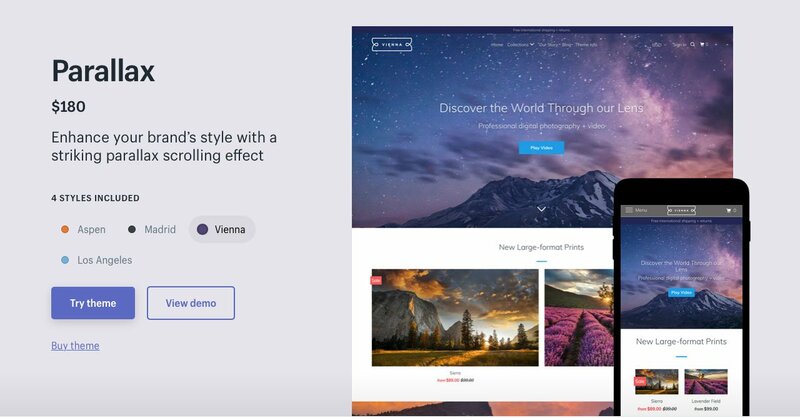 Look out for Shopify themes that let you post multiple high quality product images from different angles, as well as any video content about the product qualities, if you have one. Not only should the theme allow you to do so, but it should highlight these multimedia elements in such a way that it captivates your visitors. Themes with these interactive elements often have a higher conversion rate than ones that present static images. 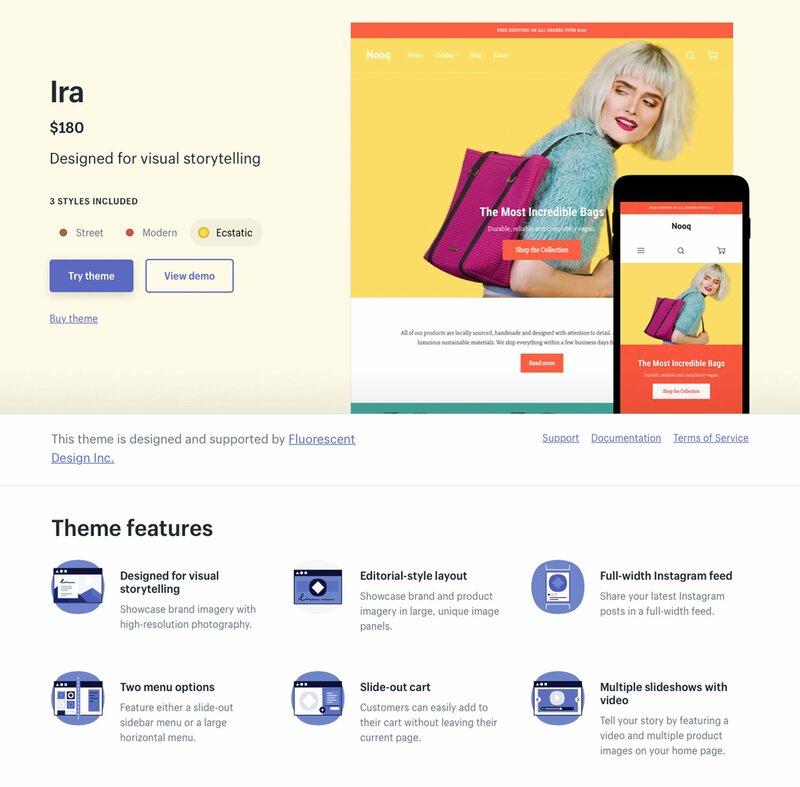 The second most important feature of a product page is the copywriting space that your theme allows, specifically for the product title and the product description. These need to be engaging and, most importantly, SEO friendly so that your SEO efforts aren’t futile due to not having enough space for your copy. The product title needs to be short and to the point while being amply descriptive, while the product description should be as detailed as possible. Consider picking a Shopify theme that showcases part of the product description (60-80 words) and hides the rest under the drop down menu on the page. This will help keep the look of the page clean and you can use the rest of the page’s real estate to incorporate additional elements of the product page. Speaking of which, another important driving factor for your conversion rates are customer reviews. Be sure to include them on your product pages as they provide visitors with an added incentive to stay on the page for longer and also provide social proof and credibility for your brand. Incorporating social share buttons on your product pages is another way to encourage visitors to share your products with their peers and social followings, which can potentially help target demographics or customer bases that you may not have otherwise been able to reach. It is also important that you have a clear call-to-action that stands out on all product pages so the visitor knows exactly where to proceed to purchase your product. The placement should ideally be immediately next to or around the price display of the product and should repeated once again at various points of the page if your product pages are lengthy. While all the above mentioned points discussed on-page elements, the other factors that make up a good product page include the load time and its mobile friendliness. You want to pick a Shopify theme that loads quickly on mobile devices as well as desktop devices alike. 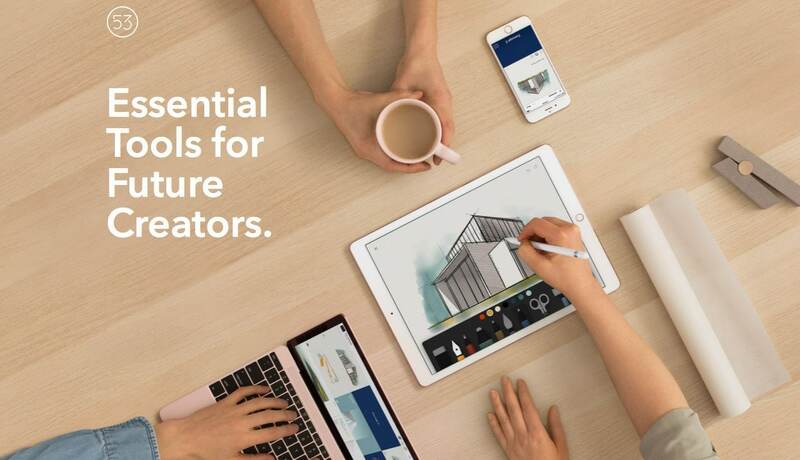 For this purpose, minimalistic themes are likely the absolute best as they let your products speak for themselves while being lightweight and mobile device friendly, too. Almost every point mentioned in the above product pages section is also applicable to category pages. This includes making your products the focal point of every page on your website, using mobile friendly themes, choosing minimalistic themes to showcase your products better and even using well written copy – it all applies. 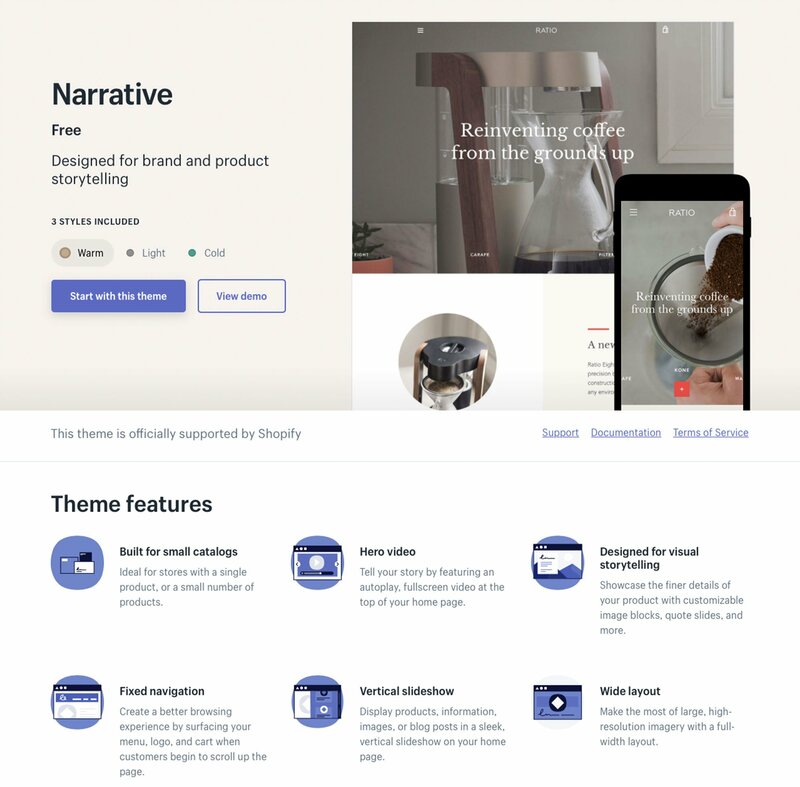 The majority of Shopify themes have three major elements displayed on each category page: Crisp titles, a fluid and intuitive navigation bar and of course, your list of products. Let’s start with the first element: Crisp titles. The titles of a category page are also called “Heading Tags” or “H-Tags” and need to be customized according to your products. One of the major mistakes that are made on the category pages are having little to no indicator about what the page is actually about. While you might want to play around with words, come up with a funny pun or have an “out-there” category name, you’re maybe missing the point completely. While that tactic could certainly work sometimes, if a visitor can’t even tell the theme of the content or what they are looking at exactly, then there is no point in them staying on your website. The heading tag should reiterate that the visitor has landed on exactly the page they were looking for and then entice them to stay there for as long as possible. As mentioned earlier in the product pages section, the copy and content also matters when it comes to your category pages. Your content needs to be perfectly optimized on your category pages because that’s another one of the locations on your website where customers learn about your products and connect with your brand. Think about it: Would you buy a product from a website that provides no product descriptions, customer reviews or any other such information? Would you actually spend your hard earned money on something so vague? The same principle applies to your category pages, too. Getting the right amount of products per category page is another balancing act. Too many on one category page can slow down the page load speed. Too few on one category page means that there are several pages that the customer has to go through to see all the products that you have to offer. Not only is this a tedious process, but the chances of the customer leaving before they see everything you have to offer is higher. To strike the perfect balance, you need to find a Shopify theme that provides filtering options on the category pages where all the products can be listed. This format tackles several issues: All the products on the page get crawled and ranked by search engines and yet the page load speed is not compromised. Only the images that the viewer is currently viewing will load, the rest will load once the viewer scrolls down the page. Even though the page load time issue is more or less resolved, customers might not want to scroll through hundred of products, if that’s how many products you have on your site. 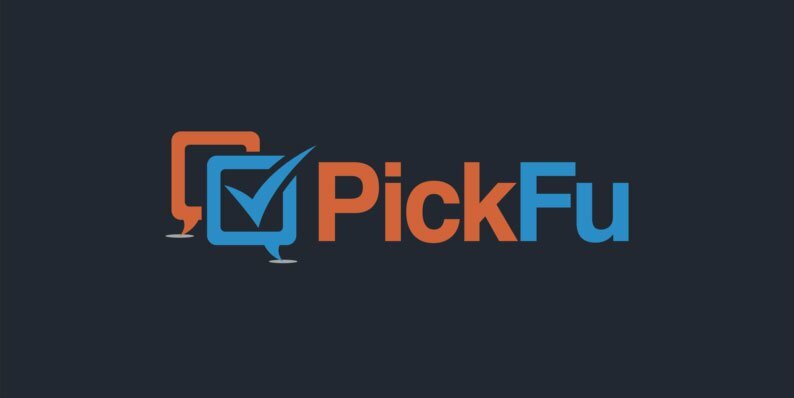 This is where the filter becomes extremely useful; customers that aren’t looking for anything specific and are just browsing will be more likely to scroll through the products at their leisure, while those who are looking for something in particular can make use of the many filters to get them to the products that truly match their purchase intent. However, this will require your Shopify theme to allow for multiple filters to be placed on the category pages, so choose wisely! Your homepage can be where you weave and tell your brand’s story. 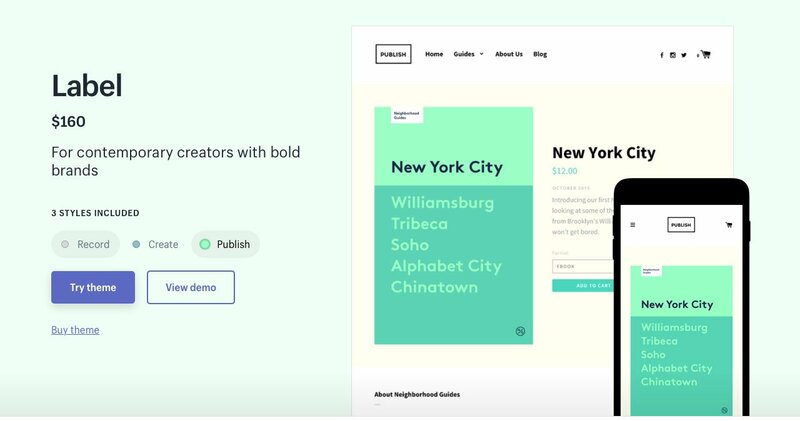 This will give the user an essence of what you and your brand stand for – and this will most definitely reflect throughout your Shopify theme as well. This is also the page that will attract the most returning customers or any referrals. Referrals will “get the feel” of your brand by exploring your website but will be most likely to base their first impression off of your homepage. This is why your homepage needs to have engaging content, portray the best that your brand has to offer and overall have a welcoming and warm feel to it. The more comfortable a newcomer is on your website, the higher the chance of them turning into a customer. Be sure to strike a balance on your homepage of the different types of customers you cater to. Your Shopify theme’s homepage should keep your returning customers happy and encourage them coming back over time – this means that your homepage should be frequently updated and show offers, sales and new collections throughout the year. At the same time, new visitors to your site should be captivated enough by the homepage that they stay and look around. A/B testing is one of the best ways to plan digital marketing and online strategies for your business as it is applicable to everything, from email newsletters to copy for your website to the theme of your store, etc. The reason an efficient A/B test can be so effective is because it highlights differentiating components from your variables, which gives you a unique advantage of combining the most successful elements from both of these variables to make it a super-successful one! Determining through A/B testing which variation of your theme will improve your customer conversion rates the most and which, in turn, will churn out the most revenue for your business, is obviously useful data to have. A smart marketer will know that it’s always good to have empirical data backing up the reason for the success or failure of a business endeavor. Consistently conducting A/B tests has been proven to improve the bottom line of businesses as they have data insights into what works. Then, being able to combine that insight with experience and other elements that work is definitely the key to a well executed website. 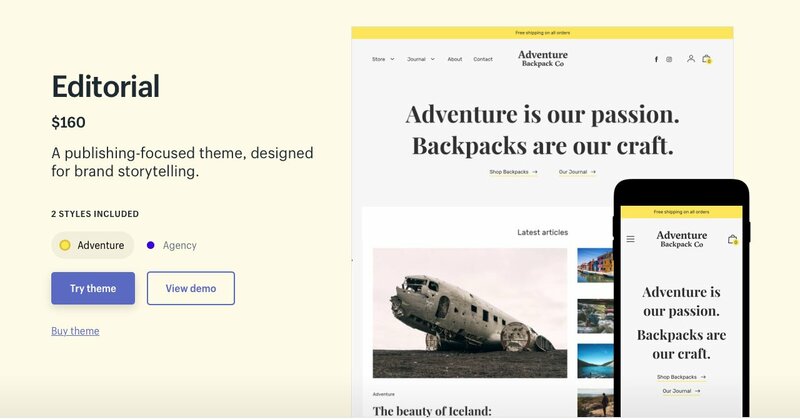 Almost any part of your Shopify theme can be A/B tested: The homepage headline, sub-headers, images, content, call-to-action buttons, product and category pages, etc. So how do you conduct A/B tests on Shopify? All good Shopify themes have similar core elements. 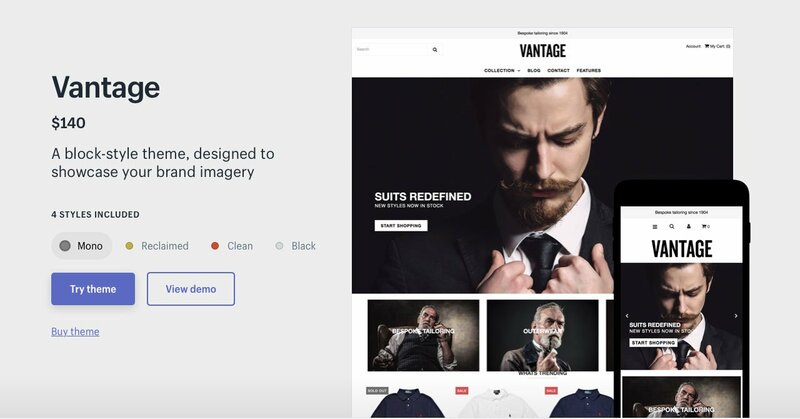 Apart from the obvious ones – such as the price, content and image layouts and individual product and category pages – the mark of a truly impressive Shopify theme is that while it displays all the copy, content and necessary information that is crucial to present to the customer, it will still be minimalistic and leave your website uncluttered. The design could incorporate tabs, hamburger menus or drop-down tables to present secondary data but ultimately, all the important information is one click away from the homepage and everything else can be accessed by neatly tucked away menus. To retain even more customers, a good website theme will ensure that there are no “dead-ends.” What does this mean? Well, once you go past the homepage, pick a category, go onto the category page, pick a product and then land up on the product page, should that be the end? Is the only way out from there the checkout page? A well designed website theme will link out to other relevant pages of the website or will feature other products that are relevant to the visitor’s search in the attempt to upsell or cross-sell them to different products. By having a theme that supports these different functions you’ll be able to create a stronger web of pages for your visitors to peruse, which will keep them on your website longer and make them more likely to purchase a product. The thing about Shopify themes is that even though they provide you with a strong structure or foundation for your website, there will still be a certain degree of customization needed on your part to make your theme your own. 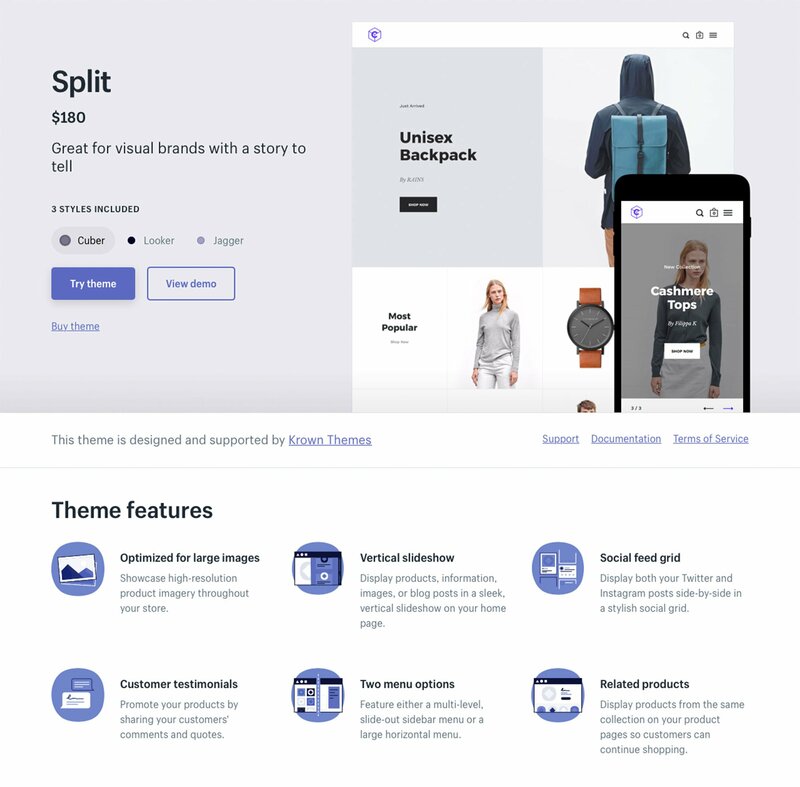 The advantage to this is that you don’t need to be a web designer, developer or programmer to customize any Shopify themes; Shopify itself has a simple edit panel that has preset customization options from where you can modify your theme from. The steps are as follows: In your Shopify dashboard click Online Store > Themes > Customize Theme, and on the sidebar you’ll see each section of your theme that you can customize: The Header, Body, Footer, etc. You can get a pretty good idea of how the customization process works just by playing around a little. If you have experience with web development and programming, you can use the Advanced Editing feature, however if you don’t have experience, you should steer clear of those settings to avoid publishing errors and bugs. 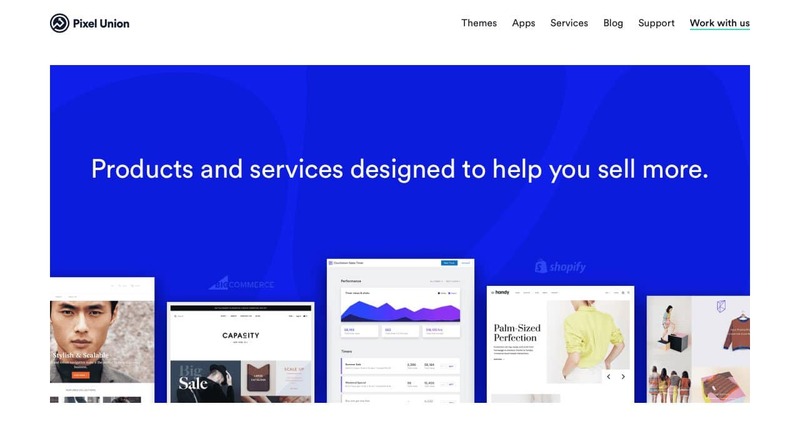 Most people will tell you that the Shopify theme store is of course the first place to look for Shopify themes and that almost no one has had the experience of downloading and installing a poorly designed theme from the official store. Out of the Sandbox is an award-winning seller of premium Shopify themes for Shopify store merchants. 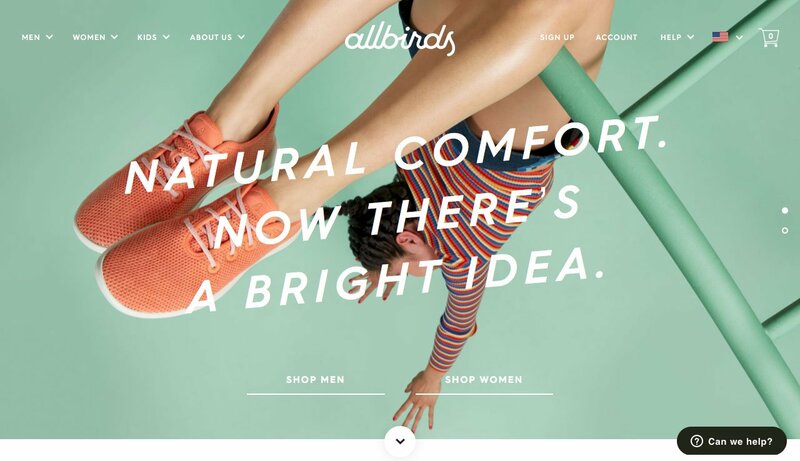 They create robust and flexible Shopify themes for merchants so they can create beautiful and functional ecommerce stores that can handle every aspect of their store from products to content and everything in between. 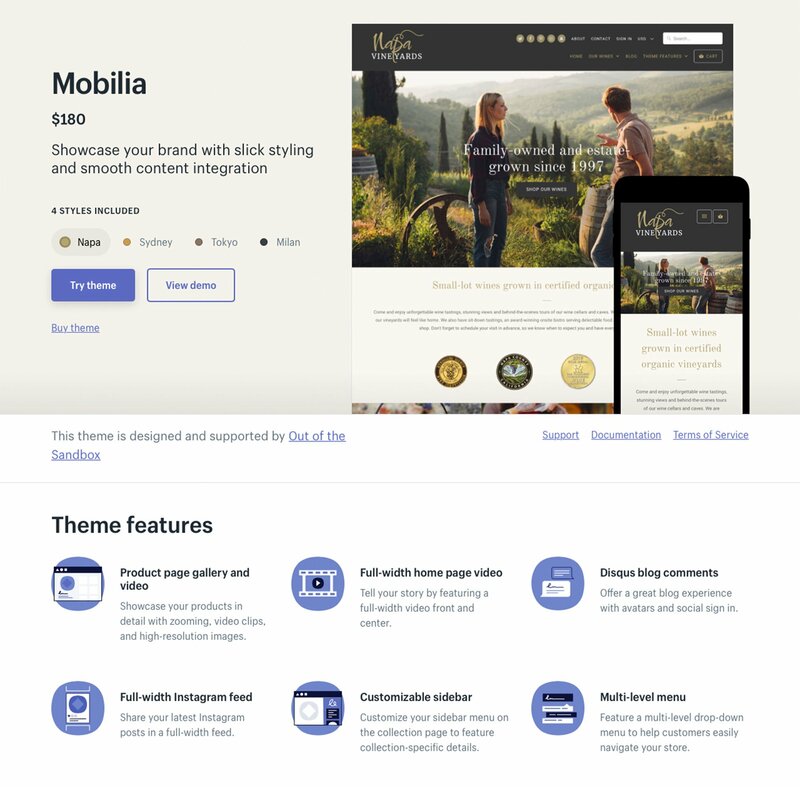 They provide 20 premium themes and offer full documentation and support so they’re an ideal choice for merchants looking for sophisticated themes that will help their store stand out from the competition. For merchants looking for optimized themes with powerful performance, Out of the Sandbox’s themes are worth checking out. Pixel Union is another highly regarded Shopify theme provider because they service both budding entrepreneurs and Fortune 500 companies alike. 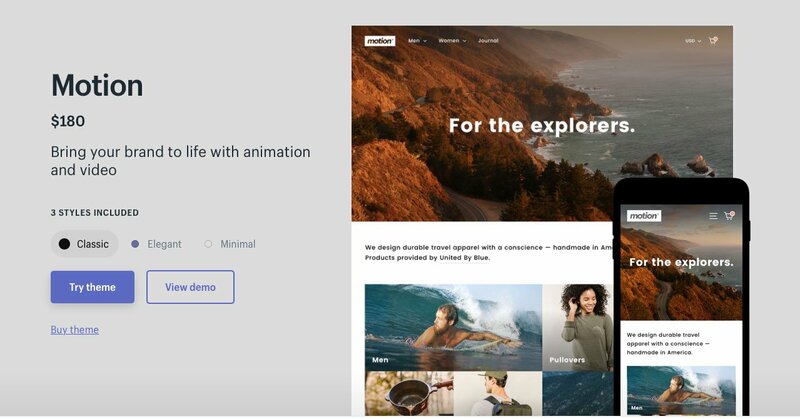 They’ve earned one of the biggest names in Shopify theme design and for good reason – their themes are created to harness the power of the Shopify platform and merchants’ selling potential all within their premium themes. 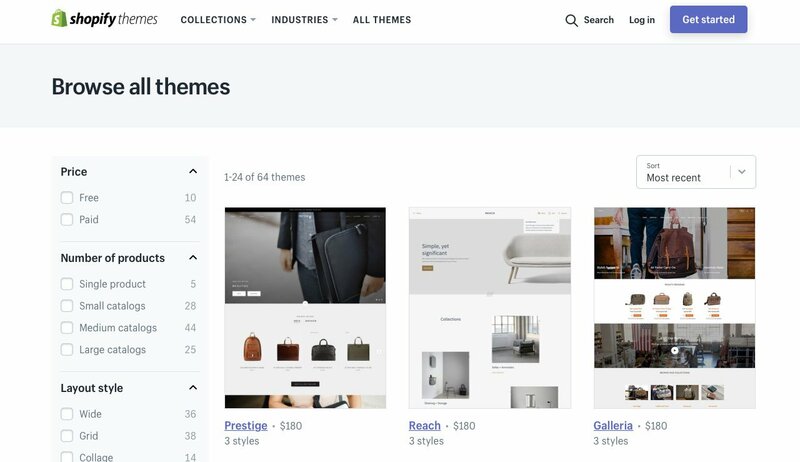 With 10 premium themes to choose from, there’s something for every merchant whether you sell one product or a marketplace of them, and they even have the capabilities to create custom themes for merchants looking for something more bespoke. If elegant themes with functional features is what you’re looking for, then Pixel Union is a must. While narrowing down and picking the perfect Shopify theme for your online store might seem like a daunting task, when you see the effort, time and resources that you have put into the process and get a return on your investment through high customer conversion rates, it will all be worth it. Are there any specific elements that you like to focus on when selecting a Shopify theme? Any advice or tips that you have learned from experience? 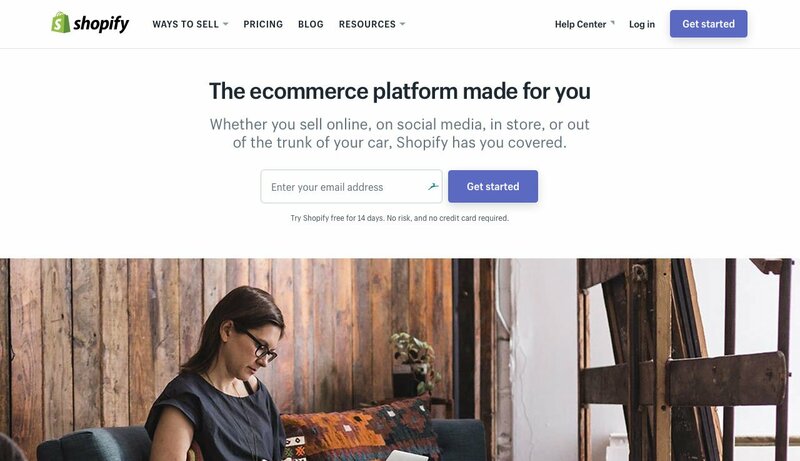 We hope this article has helped simplify the Shopify theme selection process for you so that you can focus your energy and resources on other parts of your business and let your Shopify theme do the talking.